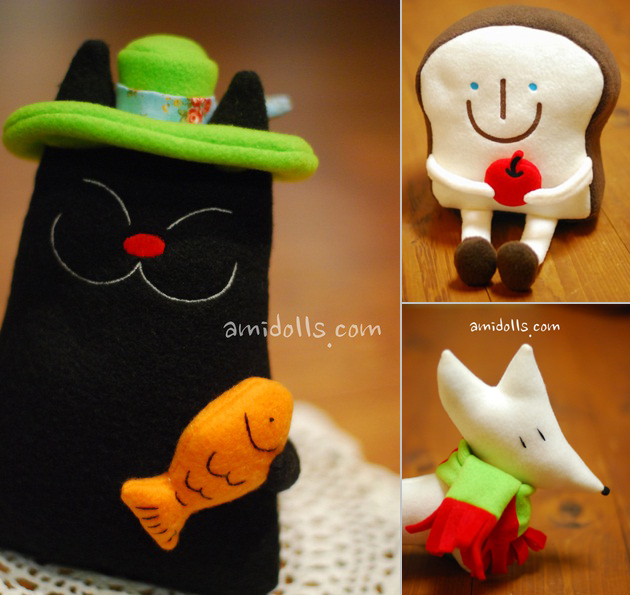 Ami Dolls: Would you be my Valentine? Valentine's Day is one of those celebrations that my husband and I love to share with our girls. On that day, the little ones come up with an abundance of drawings, handmade cards and little treats that really make our hearts go Awww!! Over the years, we (the adults) have given up the fancy dinner for two and switched to a family date, a day to say "I love you" as many times as we can, a 24-hour period to hug and kiss without restrictions. Looking at our collection of paper hearts and handmade cards, they all seem so creative and cute, but when I get into the girls' stack of Valentine's gifts from us, the feeling is totally opposite. A boring repetition of white bears and pink puppies holding red hearts is all they have. No wonder why these stuffed animals are buried in a toy box....zero love!! Definitely, I must do better this year and these gorgeous, little creatures from Ami Dolls are giving me a Valentine's inspiration... "Ami" means "friend" in French and that is what these dolls are all about... Friendly characters, each one with its own story, carefully handmade with love in Portland, Oregon and very well designed. The collection is small, but so unique I doubt you would not fall in love with one of them. 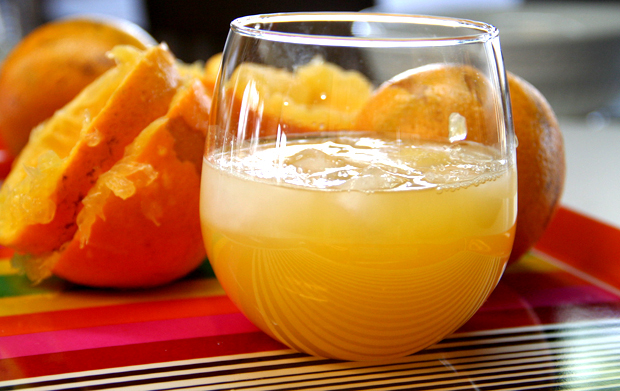 Fresh Squeezed Orange Juice... Every Day! Back in December, my sister-in-law asked me for my Christmas wish list. I sent her an e-mail saying that ridiculously, I didn't have any. I have always felt weird about wish lists. What if I'm wishing for things out of the budget? ...Why should I ask for anything? ...Aren't gifts supossed to be a surprise? Anyway, I thought about it one more time and got to the conclusion that aside from the "no surprise" factor, wish lists are great. Gift givers are already confirming that they want to give you a present when they ask for your wish list. They also want to make sure they spend their money on something you will really like. I included in my list a couple of things that even though I had wanted them for a while, I had never bought and most likely, never would. You know, those things that are not a necessity, maybe a little pricey and always tossed in the list for "some other time"... Oranges came to my mind. 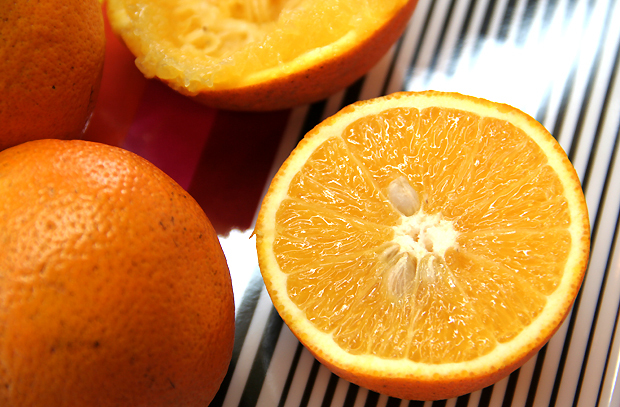 Yessss, oranges, a glass of fresh squeezed orange juice every morning, forever. 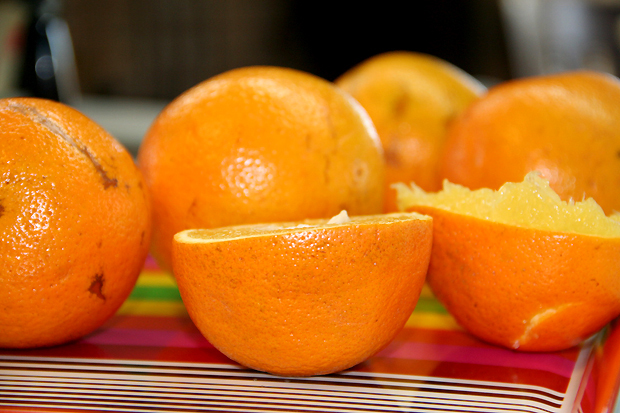 Something that I really love and was not having, because of the amount of time it takes to clean up the juicer or to squeeze the oranges manually. Good news!! ...I did get the juicer I wanted. 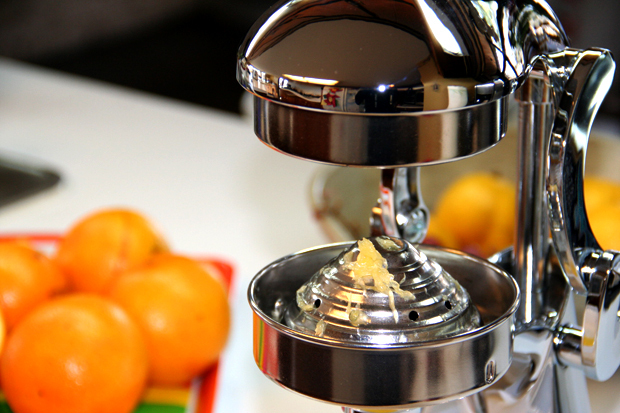 A vintage looking orange juicer that just with a simple movement of its lid, it presses all the juice out in seconds and easily gets cleaned without any aggravations. Besides, as an additional benefit, the chrome finish makes it a cool piece of decoration. It is amazing how little things can make such a big difference when they come to you at the right time. January is usually the month for successful beginnings or terrible failures. From the very first days of the month, I can foresee what resolutions will become part of my life in the new year and which ones will stay in my wish list till the next one... Dedicating time to cooking, eating healthy and providing myself and family with a well balanced diet is one of those resolutions. Definitely, a simple tool, a juicer is helping to keep up with the idea... Did you know a 6oz. cup of fresh squeezed orange juice provides 100% of your vitamin C daily requirements, plus 3% calcium, potassium and many other goodies? ...Yummm!! ...Cheers to the new year and all of those little changes that make you feel closer to success! !